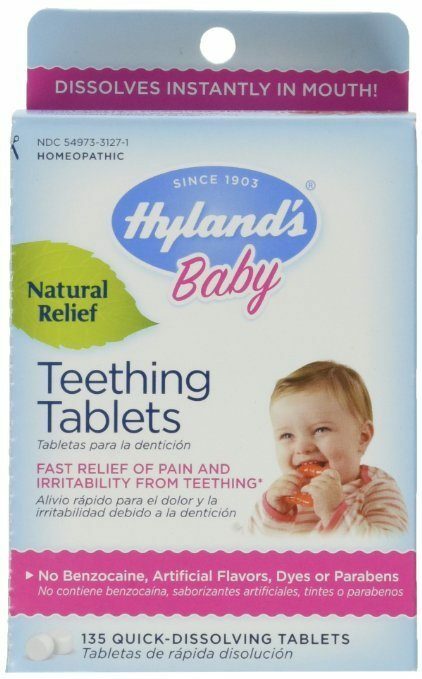 Hyland’s Teething Tablets Just $5.84! You are here: Home / Great Deals / Amazon Deals / Hyland’s Teething Tablets Just $5.84! Head over to Amazon to get the highly rated Hyland’s Teething Tablets (135 ct.) for Just $5.84 on Subscribe and Save! Something sounds good – even to your fussy, teething baby! It’s the shake-shake of a Hyland’s Baby Teething Tablets bottle. These tablets have rocked the charts by being the #1 infant oral pain reliever in America! They make nights bearable, days livable, and truly make the teething years way more groovy. Easy to use, no mess, no fuss – Hyland’s Baby Teething Tablets have perfect timing, right there whenever you need them. Temporarily relieves the symptoms of simple restlessness and wakeful irritability due to cutting teeth. Helps reduce redness and teething discomfort.